Being spotted by the designer of my WSPR transmitter must be the ultimate WSPR spot! It is Hans, G0UPL, of QRPLabs who is the designer of both my U3 to the left (turned off) and the U3S to the right. The latter was the active transmitter at the time of the spot below. This is a line from VK2TPM, Peter's excellent WSPR Watch app for Ipod. Ok, now I've done the test. 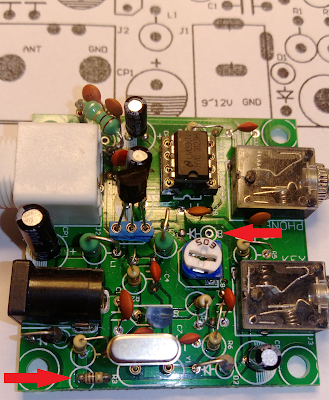 My QRPLabs U3S runs off a 12 Volt power supply. 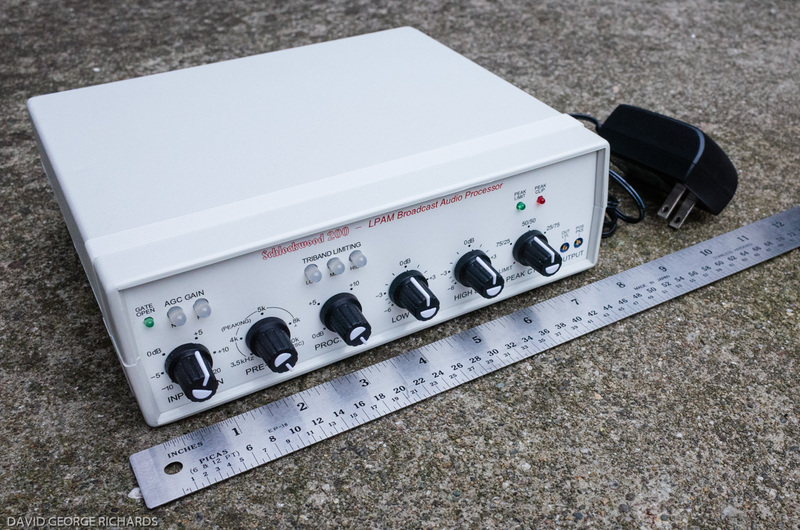 There are two step-down converters, one for 5 Volts for the processor and another adjustable one for the power amplifier, if one can call 0.2-0.5 Watts a power amplifier. See picture of these voltage converters in this post. I happened to make a new cable for 12 Volts which had the polarities inverted - and puff - there was a noise and absolutely no response from the U3S. I feared that I had blown the entire circuit. 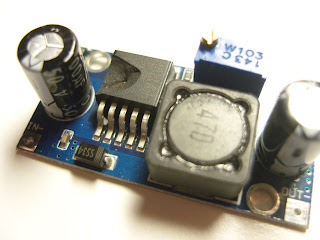 As my power amplifier was turned off, only the 5 Volts supply was affected and upon inspection I found that the voltage converter had a destroyed chip. Since since these step-down converter modules are so cheap, I had a spare. Luckily for me, the U3S worked as it should after the replacement. So the LM2596 can take a reversed polarity and sacrifices itself in order to protect the rest of the electronics. Nice! 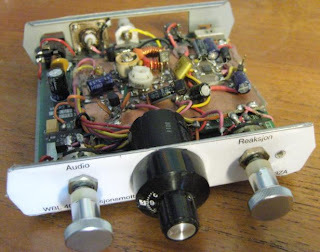 This post first appeared on the LA3ZA Radio & Electronics blog. Tasos, SV8YM, has written about "The Mysterious Case of the Withering Filters". This seems to affect not only ham radio transceivers, but FM stereo receivers as well. Tandberg from the 70's are collectors items and since I actually worked one summer at Tandberg in the early 70's they bring back good memories for me. The latest generation of receivers (2nd version of Huldra 10, Huldra 11, and Huldra 12) had ceramic filters for the 10.7 MHz intermediate frequency for FM. It is also known that these filters deteriorate leading to reduced sensitivity over time. SV8YM has pointed out that ceramic filters deteriorate due to DC on the terminals, especially the output terminal and that this leads to electromigration. In the Huldra 10, both filters have 7.1 V DC on the input. Filter F1 has 0 V DC on the output, while F2 has 2.1 V on the output. 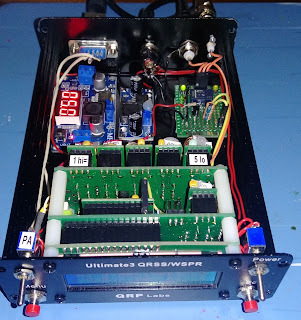 These last few days I've been experimenting with my QRPLabs Ultimate 2 and Ultimate 3s transmitting on 7 MHz. In addition to WSPR, the modes transmitted have been FSKCW with 6 second long dots, and Slow Hell with 17 second long characters. The result as received this morning can be seen on the display from the grabber of Les, G3VYZ in Northumberland, UK. This is a stack of 6 consecutive 10 second frames as can be found on the QRSS grabber site of AJ4VD. My signal is on 7,039.870 kHz and has been set up with a FSK shift of 6 Hz. Power output was 0.2 W and the distance is about 890 km. It works but the reception is much less reliable than for WSPR, which is not so unexpected. 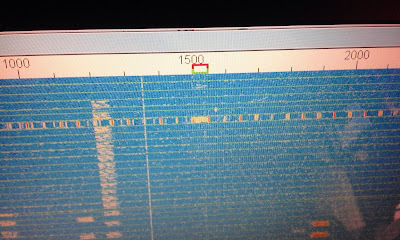 At the same time the WSPR signal was received all around Northern Europe (G, GM, DL, ON, OE, LX, LA, OY, OH, PA, SM) as well as on the Canary Islands, 3930 km away. 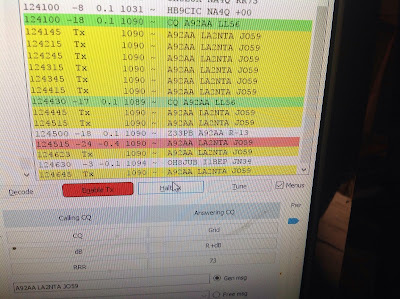 FT8 anomaly or long delayed echo? My friend Alf, LA2NTA, has sent me these screenshots from when he has been operating FT8. The first image is when operating 10 meters and took place early in November. 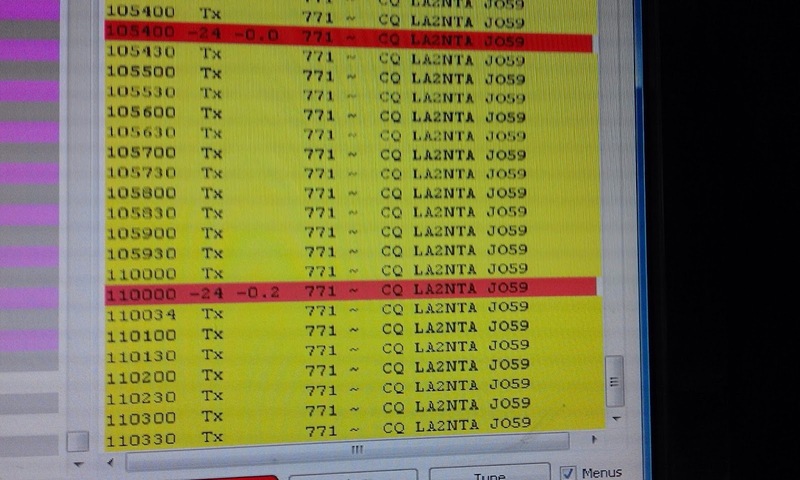 It shows how his own CQ comes back to him at 10.54.00 and at 11.00.00 and is decoded in his own receiver. The echoes return at the time of transmission. The second example is from 20 meters and took place just a few days ago. For the first example he also took an image of the spectral display. 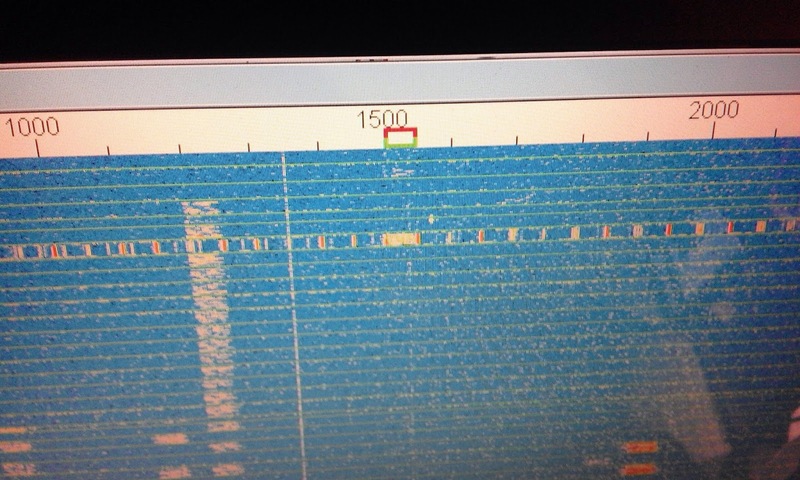 It shows lots of repeated noise burst all over the FT8 band. It is hard to explain this, but my hunch is that it is something local and not a propagation phenomenon, but who knows? The Chinese Pixie transceiver operating at 7023 kHz has become very popular. It often costs less than 5 USD on Ebay. Like most Pixies it is susceptible to broadcast breakthrough and intermodulation. Much of this is caused by the keying circuit of the audio amplifier, the LM386. The cure is to move the muting diode from the power supply pin (no. 6) to the bypass pin (no. 7). I have described this in another blog post with title: "Using pin 7 of the LM386 to reduce BCI and add side tone to Pixie 2". Here are two pictures that show how this can be done for the Chinese Pixie. One needs an additional resistor in the range 10 - 51 ohms. If you can fit it, then use the large 51 ohms resistor that come with some of the kits (I think it is meant for a dummy load). I have used 10 ohms in the picture. It replaces the old R3 of 1 k. The diode D3 is not mounted in the holes provided, and instead it is mounted under the PCB with the minus (denoted by the ring) connected to where D3's minus was, and the plus side connected to pin 7 of the LM386. in the middle, and the antenna switch to the right in the back. WSPR - The system for Weak Signal Propagation Reporter makes it easy to compare antennas if your transmitter can instantly switch antennas. The system shown here can send on antenna 1 for almost two minutes and then switch immediately to antenna 2 for the next transmission. The Ultimate 3S already has software that supports that and application note 3 from QRPLabs (Controlling additional relays using the Ultimate3S “Aux”) describes how. I built mine following that note and the experience from EA1CDV. The circuit is controlled from pin D7 and consists of a transistor, a relay, a resistor and an electrolytic capacitor. In addition I have two LEDs that indicate which antenna which is in use. In the first picture the green LED in the back right under the BNC antenna connector shows that antenna 1 is connected. The last issues of QEX have featured two interesting articles by Gary Cobb, G3TMG. He outlines the advantage of using Zolotarev designs for the harmonic suppression filters of transmitters, giving even better suppression of the second harmonic than the more common Chebyshev or quasi-elliptic filters. 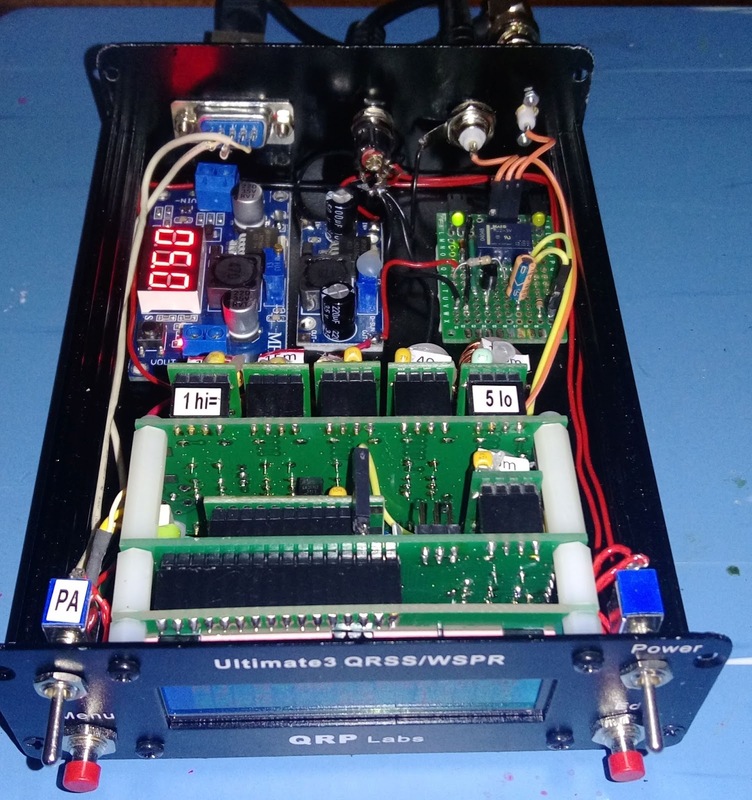 My interest in this was triggered by the test of the Ultimate 3 QRSS/WSPR kit from QRP Labs in the Nov 2016 QST. The review was positive overall, but it was remarked that the harmonic suppression does not meet FCC requirements (-43 dBc or better). I am not sure whether this is due to PCB layout issues, or if better filters can alleviate it, but I note that the design uses the simplest filter of the ones I have listed here. Welcome to the web site of Sverre Holm, an electronics tinkerer and all around geek with a recent interest in the Arduino. I live in Asker, which is just south of Oslo, and where I work at the University of Oslo. As radio amateur LA3ZA since 2001, I am fascinated by the magic of Morse code and wish I were better at it. 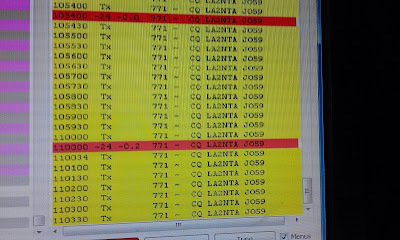 In the picture above I am in a CW pile-up as TK/LA3ZA from Corsica with an Elecraft K2 - my first love in rigs. The K2 was the rig that helped me to a QRP DXCC in 2003. I like chasing far-away stations and in 2014 I achieved a 5-band DXCC with ≥100 confirmed countries per band (80, 40, 20, 15, 10m) and then also the 3 WARC bands (30, 17, 12m). Most confirmations are with Morse on the highly recommended Logbook of the World. My present K3 station is on QRZ.com. I can be contacted at la3za (at) nrrl.no. Can One Use the Static Charge Collected by the Antenna to Charge a Battery? Arduino | 3 New MKR Shields for Your "IoT: In the Cloud" Projects: Arduino MKR RGB, MKR ENV, and MKR THERM!